I watched The Grey last night. The film explores death from a nihilistic standpoint. Its dialogue, plot, and cinematography all highlight the ugliness and crushing inevitability of death, and its very setting – the harsh Alaskan wilderness – creates a chilling atmosphere, appropriate for this philosophical agenda. In the end, the basic message seems to be something like: “death is all there is – so go out with the bang.” The poem recited throughout the movie and during its climax reminds me of Dylan Thomas “Do not Go Gentle into that Good Night.” In one very poignant scene, Liam Neeson’s character cries out to God, pleading for a sign, and he hears nothing in return. Its very touching and tragic. On the whole, I found the film a moving and vivid artistic portrayal of this worldview. And it made me reflect more deeply on why I find nihilism an ultimately self-negating worldview, one which lacks explanatory power for its very emotional force. One of my professors in seminary, Jerram Barrs, trained us to look for evidences of common grace in even the most nihilistic stories. I see points of common grace in this movie – in the characters’ feelings toward their loved ones back at home (Liam Neeson’s wife is constantly coming to his mind in flashbacks), in their laughter around a fire, in their desire to honor and pray over the dead, and in one characters’ awe and sense of transcendence at the beauty of the Alaskan mountains. In the final scene, Liam Neeson pulls out the wallets of his dead companions and places all the pictures of their loves ones facing up on the ground. It is portrayed as an almost hallowed, sacred act. And his flashbacks to his wife throughout the film are portrayed almost as excursions into another world – a world of happiness, peace, reunion. All of this raises the question: how are these brighter elements of hope accounted for in terms of the movie’s overall philosophical message? Within the boundaries of pure nihilism, there is no reason why Liam Neeson’s character should love and miss his wife like he does. There is a beauty in that relationship that defies nihilism. Within the boundaries of nihilism, there is no reason why Liam Neeson’s character should cry out to God, and curse him for not answering. Why even think to cry out to God in the first place? Why be angry at him for not answering if he does not exist to answer? The very intensity of the revolt against death and nothingness testifies to the fact that we were made for something more. In the language of Dylan’s poem: if “that good night” is all there is, and it is indeed “good,” why not go gentle into it? It seems to me that the Christian and the nihilist can walk together a long way, side by side, in mutual defiance of evil, mutual resignation to fight it to the last choking breath. The Christian view acknowledges that evil is indeed staggering, unthinkable, blinding, oppressive. The Christian, I think, can weep with each dying character; he can walk into the wolf nest with the same grim determination that Liam Neeson shows; he can recite with full conviction, “do not go gentle into that good night.” His grief is not less severe than that of the nihilist. But he also knows why he values the pictures of loved ones in those wallets. He also knows why Liam Neeson’s character wishes there were an afterlife, and cries out to God, even when he doesn’t believe in God. In other words, the Christian is able to affirm both the chilling darkness and the aching beauty of the world. The Christian may struggle with evil, but the nihilist must struggle with good. Evil may be mysterious for the Christian, but good for the nihilist can only be incomprehensible. And I think the Christian worldview ultimately provides a rational basis for evil as a “fall,” a deviation from good, as well as hope for its destruction through the life, death, and resurrection of Christ. When I saw the movie at the theater, I left during the credits. This time I let it keep running, and I noticed there is a brief clip after the credits have run. 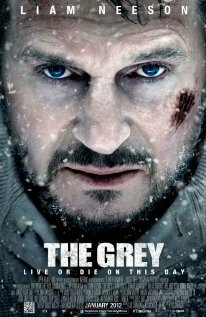 It shows the Alpha grey wolf which Liam Neeson began to fight as the movie ended lying on the ground, breathing slowly, seemingly dying. I found this fascinating: even here, in a story soaked with nihilism, there is a hint that perhaps Liam Neeson’s character survived. Perhaps he conquered the wolf which pursued he and his friends, and the death it represented. To me, this testifies to the fact that nihilism seems discontent with itself; it constantly must step outside its own boundaries and borrow elements like hope and meaning from other worldviews in order to be existentially fulfilling, in order to make the story interesting. Thus, I feel about this movie as I felt about Camus when I read him in college: the very power of the portrait of nihilism depends on the fact that there must be something more than nihilism. ‘The Christian may struggle with evil, but the nihilist must struggle with good.’ Wow. Stacey and i watched this a few days ago Gav and I think your reflections are wonderful. I enjoyed reading your interpretation of the film. This was one of best movies I’ve seen in awhile and I walked away with a similar approach to it. The nihilist insists that life has no objective meaning and what happens, happens. They often don’t attribute any of this to a God (let alone a Yahweh, the Christian one) and they often find meaning in their own lives, actively or not. Death means the absolute end. You could consider ANY animal a nihilist, which eliminates the notion that humans are somehow special and not just descendants of apes. Nihilists don’t think in terms of Good and Evil, because they see everything as just plain ol’ Normal. The Christian insists that God created them and gave them purpose, and that death marks the beginning rather than the end. They believe prayer works and God answers prayers. In the event a prayer goes unanswered, like what happens to Liam Neeson, God is mysterious. Yet, we often see movies where the character prayers for a miracle touchdown and when they win, they can then chalk it up to God’s intervention. So really, what I’m arguing, is that Christianity defaults to Nihilism when things don’t happen. “God’s mysteriousness” is another way of saying “God does what He wants” which is another way of saying “Things happen or don’t happen”. The difference I think is that Nihilists don’t throw in an imaginary God to explain the way things are. True, a lack of a coherent explanation of why Touchdown Jesus was burnt to the ground or why a church bus went off a cliff and left no survivors is hard for a lot of people to grasp, but at least there’s no distinction between the false dichotomy of “Christian God” vs. “Nothingness”. I think despite the tragic ending of these men’s lives, they lived lives of purpose. Even in spite of Liam Neeson’s wife’s death, he found purpose in the Alaskan wilderness. And even when that purpose was exhausted and he thought of committing suicide, he found purpose after the crash. I don’t see the wolves as necessarily evil, I see them as wolves doing what wolves do.. and the characters seem to be defying Nihilism… only to embrace it upon their demise. If you knew you would survive your own death, why would you fight to the very end for it? I watched The Grey last night, and it left me thinking and dreaming all night long in the realm of nihilism. I cringed at writing an adequate review, as my understanding of the nihilistic worldview is hampered by my own Christian worldview. But I found this excellent review and decided to share it as a reblog. As far as a rating for the movie, I’ll give it three out of five stars. Very good reveiew of a very good movie. I appreciate your looking at the subtexts of the movie you exploration of it themes. I really appreciated the honesty and reality of the movie. I have read quite a few reviews dismissing the movie as far too hopeless and nihilistic but I think you caught the nuances that the producers were trying to convey. Christians and nihilists could have much to discuss in light of this movie.